Google Nexus 7 Manual | The Google Nexus 7 manual or user guide now available for download in PDF format. The Asus or Google Nexus 7 tablet manual also known as Nexus 7 ebook guide that contain many reference information and important instruction which can help owner of this tablet. 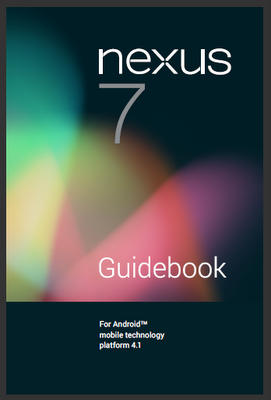 The Asus Nexus Tablet User Guide has 84 pages, with file size of 10.1 MB and support in english language. In the Google Nexus 7 owner manual you can find information such as about tutorial turn on and sign in, charge the battery, use a Google account, Jelly Ban tips, using home screen on page 7, About Google now, touch and type, also face an unlock on page 15. Moreover in the Google Nexus 7 user manual also provide detail information about Google play, manage download, using apps and Gmail, find people, celndar, sound settings and change the wallpaper on page 25. Another tutorial about Google now cards, tips and trick, search settings, pruvacy, memory and data usage, use the keyboard, and connectet to Wi-fi networks, VPN settings.